A week after the strike and the pickets in Glasgow, thousands of Google workers, from Tokyo to New York, abandoned their desks and workstations and took to the streets in protest, in response to a series of revelations, published by the New York Times, concerning cases of sexual harassment perpetrated by several managers of the high-tech giant and conveniently covered up. Google, like other giants of the digital economy such as Facebook, has been wearing the mask of progressive capitalism for years: an employer who exploits, yes, but without discriminating between women and men, trans and cis, gay and straight, and one who is even happy to pay for the costs of freezing eggs and IVF. The protest, however, was not limited to cases of sexual harassment at work; it articulated a series of claims among which the demand for protection and trade union rights stood out. As Moira Donegan wrote in The Guardian, “The protest focused with admirable clarity on the interdependency of gender and class inequities, and hints at the possibility of unionization efforts among tech workers.” These two strikes, the latest in a long series of strikes with women as protagonists, from the March 8th international strikes to those of hotel and education workers in the United States, confronts us with an apparent dilemma. What are we talking about when we talk about women’s strikes? Is this class struggle or a new feminist wave? This, of course, does not mean that the evolution of the theoretical debate of previous years has had no influence on the movement’s reflections and slogans. On the contrary, the transfeminism and the anti-essentialism of the movement are certainly indebted to queer and trans theory, and its internationalism and anti-racism are strongly influenced by work on intersectionality and on the relationship between capitalism and racialization. However, the notion of a proliferation of “waves” suggests a historical continuüm of feminist mobilizations from the second wave to the present, obscuring the nature of the current feminist movement as an event – and thus its potentialities for political and social disruption. While the second feminist wave, in the Sixties and Seventies, had a core of advanced capitalist Western countries as its centers of propulsion, the current feminist wave was born from the “periphery” – from Argentina and Poland – and it rapidly spread to a global level, assuming a mass dimension in a series of countries most affected by the crisis and by austerity and debt containment policies (Italy, Spain, Brazil, Chile…). The use of digital technologies and social media has contributed enormously to the immediate transnational character of the movement, encouraging not only coördination of struggles, but also the circulation of documents, ideas, slogans, analysis, and information, encouraging a dynamic expansion of the mobilization. But it is above all the strike that constitutes the most important novelty of the new wave. Not only because the strike has put women’s work, women’s role in social reproduction, and the relationship between production of commodities and reproduction at the center of the debate, but because it has become the main engine of a process of subjectivation, through which a new anti-capitalist feminist subjectivity is emerging, one that is strongly critical of liberal feminism, which is also present within the new wave: just think of some liberal tendencies of the Women’s March in the United States, turned into a progressive appendage of the Democratic Party, or the carceral declinations of #metoo. The potential impact of the current process of feminist subjectivation emerges most clearly when one takes into account the fundamental difference between this wave and the first two. In extremely schematic terms, the first feminist wave – in the last decades of the 19th and early 20th centuries – took place within the process of birth and consolidation of the workers’ movement: from the growth of the German social democracy to the formation of trade unions and social democratic and communist parties throughout Europe and the United States. Within this historical process of mass politicization and the irruption of the working class on the political scene, the first feminist wave claimed the full realization of the universalist promise proper to both democratic liberalism and socialism by agitating around the slogan of equality: equality of capabilities and rights. The second feminist wave took place within another process of class subjectivation, that of the onset of the New Left in advanced capitalist countries and of the wave of anti-colonial and national liberation struggles. Within this process, the second wave appropriated the watchword of difference, borrowed from black nationalism, to denounce sexism in society and within the movement and to give voice and visibility to a specificity too often silenced. The context of the third feminist wave is radically different, since the new feminist movement is not the expression of a particularism within a broader process of subjectivation. The explosion of the feminist movement was, of course, preceded by other mobilizations, the season of struggles of 2011–2013 with international visibility (in particular, Occupy, the Indignados, and Taksim Square), with which it presents some elements of continuity. Like these previous movements, the feminist movement was born outside and independent of all the parties and organizations of the traditional left (or what remains of it). And as in 2011–2013, one of the characteristics of the feminist movement is the speed with which specific and partial claims – the denunciation of femicides and the attack on the right to abortion – have transformed into an overall condemnation of the system (the capitalist mode of production and its state institutions). However, the anti-systemic nature of the 2011–2013 mobilizations was not matched either by a capacity for organizational sedimentation or by an ability to identify practices of struggle and strategies corresponding to the radicality of the analyses and aspirations. From this point of view, the feminist movement was born from the ashes of the previous season of social movements. It has inherited some of its characteristics, but at the same time it has taken a crucial step forward: the internationally coördinated adoption and reinvention of the strike as its main form of struggle and as its political identity. Far from expressing a particularism, a partial perspective, within a broader process of subjectivation, through women’s strikes the feminist movement is increasingly placing itself as the international process of class formation of this phase. The Marxist tradition is haunted by a paradox. On the one hand, for Marxism the notion of class struggle is a fundamental heuristic instrument for the interpretation of the nature of capitalism and of capitalist historical processes, and it constitutes its political-programmatic horizon. On the other hand, what exactly a class is is perhaps the most controversial and ambiguous question within not only Marxist debate, but Marx’s own writings. In Marx, class sometimes designates a metaphysical entity or a moment in a philosophy of history that results in the negation of negation. At other times, it indicates and defines the industrial working class on the basis of objective sociological and economic criteria. In The Poverty of Philosophy, Marx famously distinguishes between “class in itself” and “class for itself,” but the distinction is only hinted at and is far from clear. Finally, in a series of political writings it would seem that a social group cannot be considered as a class if it does not act politically as a class, in an antagonistic relationship with another. These ambiguities have played a major role in the subsequent Marxist debate and have given rise to divergent theories. Schematically, it is possible to distinguish three main approaches: objectivist or sociological, metaphysical (where “class” is an abstract category indicating the subject of a progressive philosophy of history), and political. To understand why the new feminist movement should be understood as a process of class subjectivation, it is necessary to refer to the latter approach. For E.P. Thompson, “class” is a historical category before being a theoretical one, a category that must therefore be articulated starting from the empirical observation of individual and collective concrete behaviors that – over time – express a class character and create class institutions (trade unions, parties, associations, etc. ).1 This means that the notion of class is dynamic, referring to a historical process rather than expressing the essence of a static entity. In other words, understood as a historical category, the notion of class cannot be reduced to the sociological categorization of social groups on the basis of classificatory and quantitative criteria. For example, the definitions of the working class as the set of all wage workers or of all those who, employed or not, have no other resources than the sale of their labor-power, although not in themselves false, are vague, abstract, and incomplete. In short, these definitions contain an element of truth, but if taken as complete definitions they lead to analytical misunderstandings and political errors with relevant consequences.2 On the contrary, for Thompson class is the point of arrival and not the starting point of a process of formation. As paradoxical as it may seem, class is the product of class struggle and not its presupposition. In the case of working class situations, we must therefore refer to the expropriation and separation from the means of production (proletarianization), the extortion of surplus-value through wage labor, as well as the historically specific labor processes, division of labor, and so on. However, being placed in a “class situation” does not automatically mean belonging to a class. In fact, class relationships never present themselves to lived experience in an immediate way. For example, Wood writes, factory work does not assemble workers into a class, it assembles them within a given productive unit: what the workers experience directly is their own exploitation within a given workplace, not class relationships in general. Obviously, their objective collocation within the relations of production creates the conditions of possibility for the workers gathered in a productive unit to experience a higher unity, for example the one with the workers of other productive units in the same territory, or in the same country, or worldwide, but this superior unity is not a faithful image of the structuring and division of society through relations of production. It is rather the product of a contingent and variable historical process, which Wood calls “class formation.” For individuals placed in “class situations” to constitute themselves as a class, they must fight as a class, that is, they must experience antagonism with other classes. To summarize, a class is not a thing, a static entity, but a social relationship and a political and social aggregate, which is constituted through contingent and specific historical processes. The political consequences of this theoretical approach are enormous. In fact, if the class is the dynamic, variable, and contingent result of a historical process of self-constitution through the struggle, one of the worst political errors that can be committed is to impose ready-made abstract models onto history with respect to what counts as class struggle and what does not. In fact, there is the risk of continuing to bask in nostalgia for the forms and experiences of the past (or for those that are mere figments of our imagination), rather than recognizing the processes of class subjectivation that are taking place under our noses. The logic of “parallel movements,” as Lise Vogel notes, has characterized the overwhelming majority of theories and political strategies of the history of the workers’ movement: on the one hand, there is class struggle, on the other, the women’s movement, environmentalist movements, anti-racist movements, sexual liberation, and so on.5 Within this framework, at best, one wondered how to unite these movements with each other; at worst, the various “partial” movements were accused of dividing the unity of the class, of expressing liberal tendencies, or of distracting attention from the truly central question: exploitation. The new feminist wave is offering the opportunity to overcome the impasse of this approach, because even more than previous waves it is blurring the boundaries (real and imaginary) between class struggle and feminist movement. To go back to the examples of Glasgow and Google, the difficulty in answering the initial question – is it class struggle or feminist struggle? – resides in the fact that the question is fundamentally wrong. 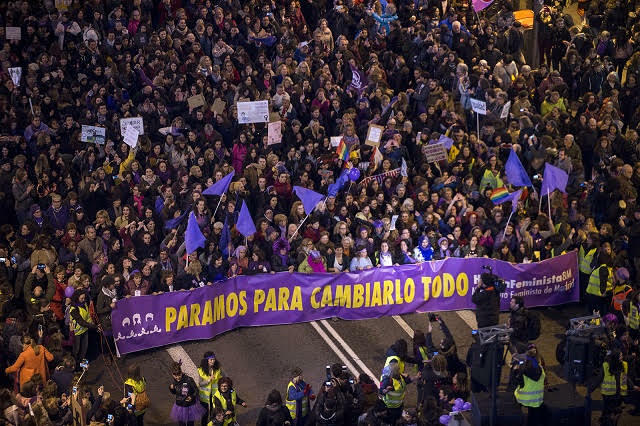 These strikes, as well as the March 8 transnational strikes, and in particular the Argentinian and Spanish strikes, are feminist class struggle. The feminist movement is becoming more and more a process of formation of a class subjectivity with specific characteristics: immediately anti-liberal, internationalist, anti-racist, obviously feminist and tendentially anti-capitalist, in excess and in tension with respect to the traditional institutions of the left and its practices. Of course, this process is not the same in each country, and is definitely more advanced in some countries than others. And yet, if we consider the movement as a whole, it is this aspect that represents its greatest novelty and embodies the most interesting potentialities. When we talk about potentialities we must also talk about the risks of failure, the necessary conditions, the work to be done, and the strategies to be adopted in order for these potentialities to be realized. The realization of the potential created by the new feminist wave requires above all a capacity on the part of the movement to reflect on itself and therefore to think strategically at the same level in which it has already positioned itself through its practice: that of an anti-systemic movement at the global level. Issues such as the consolidation of shared practices of struggle – first of all the strike – the organizational sedimentation at the national and transnational level, and the universalization of the feminist movement through its expansion to the whole society and through its capacity to speak for the whole – or “transversality,” to use the words of Verónica Gago – are among the central issues that the feminist movement will have to discuss and face in the next period. 1. ↑ E.P. Thompson, “Eighteenth-Century English Society: Class Struggle Without Class?” Social History 3, no. 2 (1978): 133–165. 2. ↑ David McNally, “The Dialectic of Unity and Difference in the Constitution of Wage-Labour: On Internal Relations and Working-Class Formation,” Capital & Class 39, no. 1 (2015): 131–146. See also: David Camfield, “Re-Orienting Class Analysis: Working Classes as Historical Formations,” Science & Society 68, no. 4 (2004–2005): 421–446. 3. ↑ Daniel Bensaïd, Marx for Our Times: Adventures and Misadventures of a Critique (London: Verso, 2002), 111. 4. ↑ Ellen Meiksins Wood, “The Politics of Theory and the Concept of Class: E.P. Thompson and his Critics,” Studies in Political Economy 9, no. 1 (1982): 45–75. 5. ↑ Lise Vogel, Marxism and the Oppression of Women. Toward a Unitary Theory (Chicago: Haymarket Books, 2013), 139. Cinzia Arruzza is a member of the editorial collective at Viewpoint Magazine and an Associate Professor of Philosophy at the New School for Social Research in New York and a feminist and socialist activist. She is the author of the author of Dangerous Liaisons: The Marriages and Divorces of Marxism and Feminism.